Can't make it to Coachella? That's not a problem -- there are plenty of great music festivals on the East Coast. If you're ready for a road trip or bus ride, these five festivals not only have a diverse lineup but are also accessible to east coast music lovers. The 9th annual day of music hosted by The Roots boasts a lineup of older and newer talent: Usher, DMX and Swizz Beatz share a stage with Kehlani, Willow Smith and Leon Bridges. The venue is Festival Pier at Penn's Landing, so you can also enjoy a waterfront view of the Delaware River. Find tickets online here. The four-day festival returns for its fifth year. It'll be especially poignant this year with Earth, Wind and Fire as part of the lineup; founding member Maurice White died earlier this month. D.C. rapper Goldlink will also share the stage. For those who want a full festival experience, campgrounds are available for tents and RVs. Other activities include an on-site craft beer bar, public hammocks and group yoga classes. Find tickets online here. For serious music lovers and creators, Moogfest is a combination music festival and technology conference. Its namesake is Dr. Robert Moog, a pioneer in electronic music and inventor of the Moog synthesizer, which continues to be used by musicians today. Festival partners include Google and MIT Media Lab, with presentations and workshops available. As for the lineup, it includes music innovators GZA from the Wu-Tang Clan, Grimes and Blood Orange. Find tickets online here. 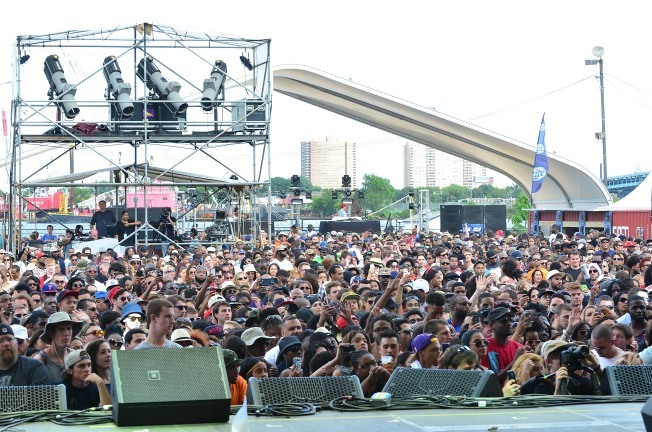 Governors Ball is quickly growing to be one of the biggest music festivals on the east coast. Its lineup has grown enormously since it started as a single-day festival in 2011. Kanye West returns as a headliner with The Strokes and The Killers. Spanning the first weekend of June, a range of music genres will be represented from Beck and FIDLAR to Miguel and Joey Bada$$. While there won't be a camping experience, a range of activities from lawn games and food trucks to art installations will make sure you're entertained, just in case you find some down time between sets. The Randall's Island location is accessible by ferry, subway, bus, car and even on foot. Find tickets online here. Since 2013, Boston Calling has festivals twice a year, one in May and one in September. It’s also one of those rare festivals where female musicians are just as represented as their male counterparts. This year will feature performances from Janelle Monáe, Australian singer-songwriter Sia, and Swedish pop star Robyn. Get to City Hall Plaza by public transportation, walking or driving. Find tickets online here.